Microsoft Excel is a spreadsheet which features calculation, graphing tools, pivot tables, and a macro programming language. Microsoft Excel 2016 is the latest version of Microsoft's Excel series of spreadsheet software by coming together with the rest of its Office 2016 productivity suite. One of the biggest new features of Microsoft Excel 2016 is that it automatically suggests graphs and charts that are appropriate for the data you're processing. Microsoft Excel 2016 is beneficial for any business that's afraid of increasing overhead with the new Office suite. Microsoft Excel practical test helps recruiting teams & hiring managers to effectively assess the candidate’s advanced excel skills before an interview. Our practical Excel test (2016) is specially designed to check the application and functional skills of MS Excel specialists as per industry standards. Our quick Excel 2016 test ensures that the new hires will be a right fit for the position of an MS Excel 2016 expert, having proper knowledge of latest version skills in MS Word 2016 including advanced forecasting, date grouping, histograms, Pareto charts, waterfall charts, and PowerPivot, etc. The process of hiring such candidates will be done through our Excel recruitment tests which are automated and will provide you with detail analytical reports of each appeared candidate. Our score reports will help you to measure the excel skills by making your recruitment process easy with an efficient budget. The Excel online assessment test may contain MCQ's(Multiple Choice Questions), MAQ's(Multiple Answer Questions), Fill in the Blanks, Descriptive, Whiteboard Questions, Audio / Video Questions, LogicBox( AI-based essay evaluation), Job-based Simulations, True or False Questions, etc. The online Excel 2016 assessment is designed considering EEOC guidelines, It will help you assess & hire diverse talent without any bias. Q 1. 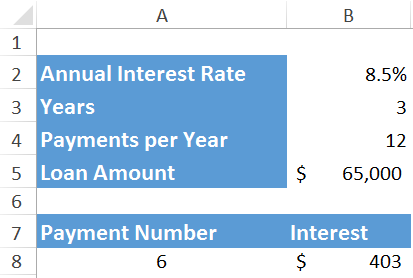 Which of the following functions will you use to get return the interest amount paid for the payment number mentioned in Cell A8? Q 2. 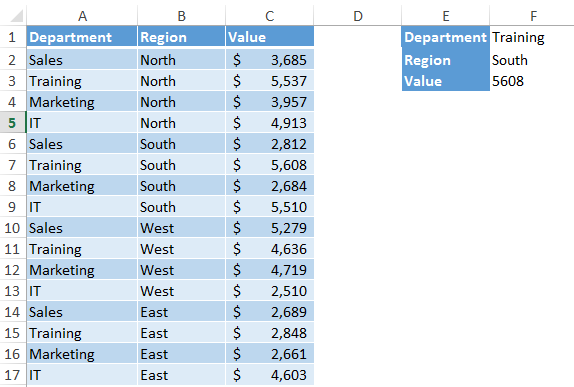 Which of the listed functions should be used to get the value for the mentioned Department in E1 and Region in E2?